1983. Miyakoya Auction – Ojiya City. This outlet is only a short walk away from the Ojiya rail station and just set back from the main route 17. It was originally built in 1963 by the late Mr. Sadaichiro Miya primarily as an auction site for Magoi, Koi followed on a few years later. The outlet was huge in comparison to the others seen on my first visit. He had a large stock of Koi dry goods which he supplied to breeders in the surrounding area. 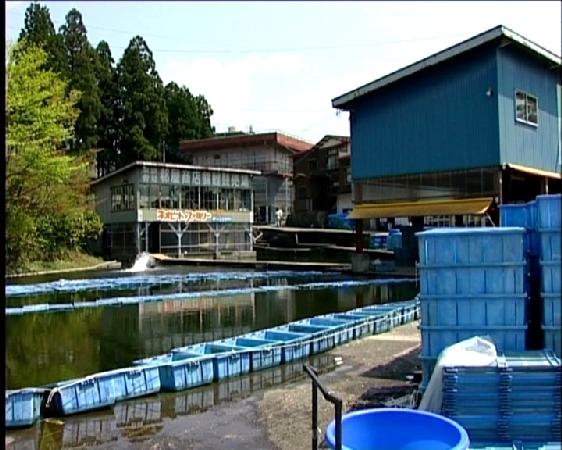 There were Koi for sale in concrete indoor ponds in many varieties and the imposing sight of Mr. Miya, wearing traditional wooden sandals left us all in no doubt as to who was running the operation. I had visited this outlet many times before (the first time in 1977) to inspect and purchase several items of dry goods which were not available in the UK but this was the first time for me to ever witness a Nishikigoi auction as it took place. At that time I did not know if I (as a ‘gaigin’) would be allowed to purchase a buyer’s number in order to buy Koi or not so I decided to try and ‘creep in undetected’ to the top floor of the auction and just watch the proceedings as they progressed from afar. Alas my attempts to remain incognito did not last as a gentleman sitting in front of me insisted on me taking his seat. Before the auction started I saw many others pointing me out and then whispering something to their neighbours. I later discovered that I was the first foreigner ever to be seen attending an auction at this outlet. When the auction commenced I watched everything with enormous interest and observed the incredibly well-rehearsed precision of the duties carried out by the auction staff to ensure everything ran very smoothly. In later years I discovered that the ‘staff’ were local Nishikigoi breeders paid for a day’s employment at the auction. As to the auction itself, it was ‘rapid’ to say the least. Auctioneers (also local Koi breeders) took turns of around 50 lots before taking a rest. I also did not understand one single word uttered by the auctioneers over the microphone despite the fact they were raising and lowering price progressions by way of hinged wooden ‘price indicators’ with a constant bang of wood against wood. There must have been over 100 people attending the auction and I tried to take in all the faces of the ones seeming to have some kind of importance in the pecking order. At that time I had no idea that I would ever have the knowledge to understand the auctioneers and thus the prices. Nor did I expect I would ever be allowed to take part in these auctions and be allowed to buy for myself. I later discovered that there were two classes of auction held here and these were – ‘General Auctions’, which formed the majority and ‘Special Auctions’ which were widely advertised in advance. The important difference between them is that general auctions are ‘sold as seen’ where bidders have to assess the lot in question with great care, despite the fact of the speed in which it is passed through. There also can be easily five sansai in one lot and so the eye of the bidder must quickly check each Koi as rapidly as possible – this is only a task for the brave and experienced! Over the years I have seen thousands of Koi pass through with only one eye; others with serious damages; others with significant deformities; others with ‘choman’ disease (stomach); others with growths etc. etc. The final price may be incredibly cheap but buying at these auctions requires constant concentration and close attention to detail. On the other hand, the special auction lots have been checked in every detail by the auction staff and guaranteed as perfect in every way. Should this ever turn out to become not so, the buyer can point this out after the auction and will be given the opportunity of having a full refund or alternatively, a severe reduction in price. These lots are cared for far more carefully and are displayed in vinyl bags which can be inspected before the start of the auction. These auctions would become extremely valuable for me in later years after I was first 100% sure of prices just by listening and also the very important knowledge of exactly ‘when’ to make your first bid. I also met MANY Nishikigoi breeders for the first time at these auctions and, in later years, I was approached after the auctions by breeders who would take me back to their outlets and show me their stocks for sale. In this way my mental lists of future contacts grew considerably which was to be to my advantage in future years. My first impressions were – ‘15% understanding and 85% total bewilderment and confusion’.